So, last night was a usual late night for me…I worked late and turned in the wee hours of the morning! So, about 5 am I woke up to the house SHAKING…I mean REALLY SHAKING!! For me to wake up for it mean’t it had to be serious because I had barely just gone to bed and was out cold! So, I wake up and although I first thought I was COMPLETELY delirious from exhaustion and was imagining it, I then realized….WE ARE HAVING A MAJOR EARTHQUAKE!!! I grew up in California and I recall the earthquake feeling very vividly so as soon as I got my bearings about me, I KNEW that is what was happening!! It measured 5.2 and lasted 40 seconds, which is a LONG time when everything is shaking violently!!! It was CRAZY!! Did anyone else feel it!? I heard it was based in Illinois and was felt from Chicago to Western Illinois, to St Louis, Louisville, Michigan and all of Indiana!! They said it’s the strongest earthquake to hit the midwest in our lifetime!! CRAZY!!!!! I live just outside of Evansville and it woke me up this morning. I’ve never experienced anything like it, so I had no idea what was going on. It just seems unreal that we would have something like that happen here. Sounds like everyone was safe, though, so that is good. We felt it up here in Grand Rapids, MI. We woke up and thought the ceiling fan was going to fall down on our bed! Kinda crazy and had no idea what was happening until I watched the news this morning and then it all made sense! So crazy!!! My hubby gets up around 5-5:30, so I was a little awake from his alarm clock. I felt our house shaking and thought it was just really strong wind. I ran down stairs to shut some windows I had left open and was SO confused when I saw that it wasn’t windy out at all. I can’t believe that was an eathquake….CRAZY! Totally felt it. Thought we were being robbed, lol. I blogged about it too! 😀 Seriously crazy. Think this is just the beginning? Yep, felt it in Fort Wayne, but I’m such a stong sleeper I thought it was a garbage truck. ; ) I wish I had been awake!!! SCARY!!! I’ve lived in California my whole life and I am deathly afraid of earthquakes. Like, I sleep in the door jam for a week after the earthquake, scared. I know all the seismologists from Cal Tech by name. 5.4 is a big one! I bet you were so scared! I hope you don’t have any big aftershocks! I was awakened by the sound of my dogs restlessly pacing around the kitchen. A minute later it hit. I felt the one in 1987, but that was a minor rumble compared to this one. Kind of scary – not knowing exactly what to do in the moment. Kids thought it was cool though, of course! Yeap! I felt it too! I was up feeding Maya, when the bed began to shake. I thought I was going nuts… then I turned on the TV to find out that I wasn’t losing my mind! OH MY GOSH! Jesss! I’m so glad you guys are okay- I didn’t even know this got to you guys (show’s how much news I’ve been watching)! That is so scary! How about your folks, Jenny & Chris? They felt it too?? wow! Well I’m glad everyone is okay. 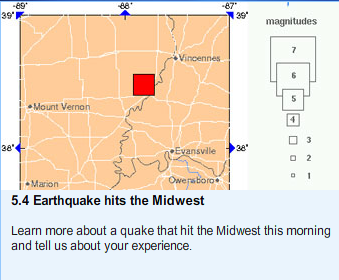 We missed you in L.A. Go figure – Indiana gets earthquakes? Who knew? I was in the middle of an interview when I felt the after shock the next afternoon. I didn’t even know we had an earthquake since I had just driven from Nashvile!!!! !